Tottenham's new stadium has suffered a number of construction delays. Tottenham boss Mauricio Pochettino says moving into the club's new stadium will "help the team to achieve more". Spurs sit second in the Premier League table, six points behind leaders Liverpool, who Pochettino says play in a "party"-like atmosphere at Anfield. Tottenham's new 62,062-seat ground, located at the old White Hart Lane site, was due to open in August but is now expected to be ready early in 2019. 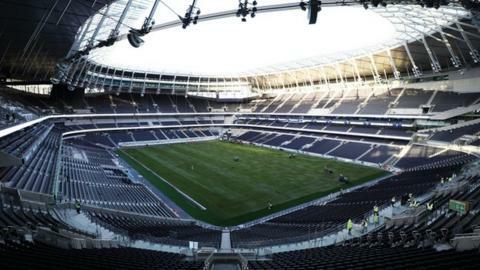 Pochettino says Spurs will move in "the moment the new stadium is ready". Tottenham are currently playing their home games at Wembley - where they beat Bournemouth 5-0 on Wednesday - but the Argentine is keen to start playing "as soon as possible" at "our new house". "To play in your own stadium is the best thing that can happen in your life," he added. "It's going to be a massive boost for the team. It's going to be a place where the fans can help the team to achieve more. "There is no doubt. I am so happy with Wembley but tomorrow if the new stadium is ready we are going to move to our new house." Pochettino says he could feel fans at Liverpool's Anfield ground "desperate to win" when watching highlights of the Reds' 4-0 win over Newcastle on Wednesday. "Anfield was amazing, every game Liverpool play at Anfield is a party and that sometimes makes a difference," he said.